It’s crucial to involve teenagers when you are planning your trip so they take some ownership over the whole experience and it’s just as important to build activities into the itinerary where the teens can have some independence too. Oh and did we mention good wi-fi? Cities appeal to teenagers in different ways to younger children. Look for places renowned for their vibrant festivals, street musicians, street food. Teenagers are better equipped to cope with the developing countries – including India, the Middle East, South America and parts of Asia – that you might avoid with younger children. Now would be the time to take the family on the trip of a lifetime to Antarctica. The options for safaris increase as children get older, so more adventurous excursions – perhaps a walking safari in South Africa – is worth considering now. Learning things is a good way for teens to engage with the destination. Think about diving, surfing, sailing, skiing or snowboarding, stand up paddle-boarding or fishing. If you’re in a resort think about tennis or golf lessons to fine-tune skills they already have. Cooking provides wonderful learning opportunities. Learning to make dumplings in Shanghai or gnocchi in Rome will engage them in the location and add to life skills at home. Teenagers with an artistic bent can also engage with their environment through arts and crafts. Look for short tours that will take teenagers away from the family unit (for much sought after independence) and play to their strengths and interests. Enrol the whole family in a language class, especially if the kids already learn the language in question at school. You can start preparing for this before you depart. This is also the age when you can introduce the idea of voluntourism or giving back to the community you’re travelling in. We have so much and many of the people in the countries we travel to have so little. 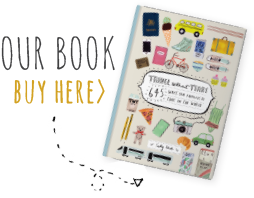 It’s a gift for teenagers to understand that early and to develop a social conscience with regard to travel. Your teenage travelling companions will no doubt shy away from being told what to pack for the plane. They’ll have the technology aspect sorted with phones, iPods and other equipment loaded with playlists, apps and games, They won’t need a parent to tell them what they need, although they might thank you for suggesting noise-cancelling headphones, which make such a difference in flight. However even the most dedicated digital native needs something that can pass the time when the screens are off. Make sure they have at least one book to read. It’s an added bonus if this is somehow related to where you’re travelling.